I woke up in my suite at Hotel Lone knowing it would be my last morning in Istria. 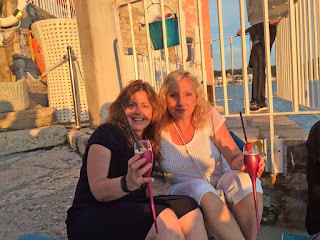 Although my friend Lynn and I would be staying in Croatia a few more days, this was the last day we would be spending with the Share Istria group, a terrific set of guys we had gotten to know well. It was the first place Lynn and I had our own hotel rooms so we met down at the restaurant for breakfast. 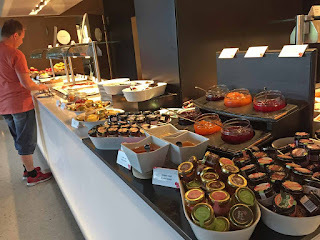 The Hotel Lone in Rovinj has one of the biggest buffet breakfasts I have ever seen, and it was included with our room. The rows of fruit, cheese, Danishes, croissants, meats, eggs, yogurt, and covered half of the large dining room. I took my selection of a yogurt smoothies, chocolate croissant, brie and spinach quiche out to the deck. 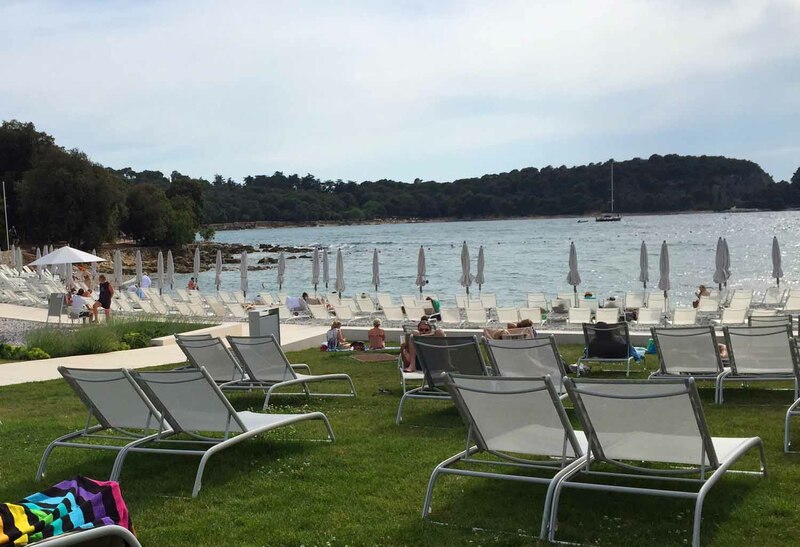 It looked to be another comfortably warm day in this area of Croatia. We sipped our cappuccinos for a bit before going to our rooms to get ready for a full day. Goran Franinovic of the Istria Tourism Board had been our guide throughout the week, and a perfect one at that. His colleague, Marko Markovic, whom we met on the first day, would be taking over from here. It may have not been on the Adriatic Sea, but it had the same warmth I felt all over this region of Istria. We had lattes in a café that was lined with art as we were briefed on the tour we would take through the cobblestone alleyways and into art galleries of Grožnjan. Lynn, an artist herself who specializes in silver jewelry design, was especially interested in the art, which varied from ceramic to wood carvings to coral pieces. 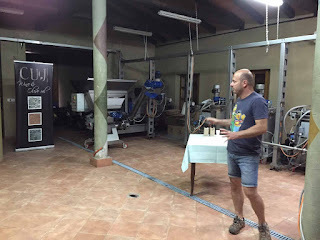 After a few hours we headed to CUJ Winery and Olive Oil. 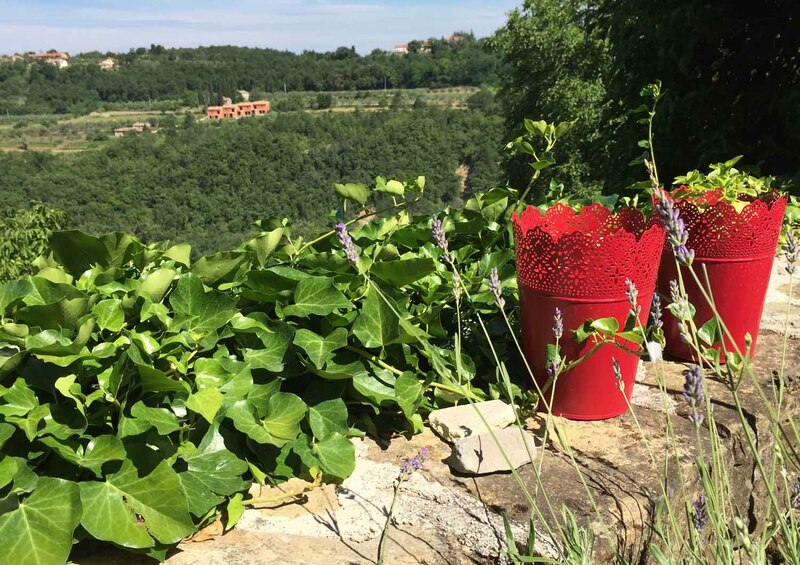 While it’s not a combination those of us in the U.S. are used to, it is very common for Istrian wineries to also produce olive oil. We walked through the vineyards and toured the production area at CUJ. It was set up for strictly small batches. We tasted both wine and oil and really enjoyed both. 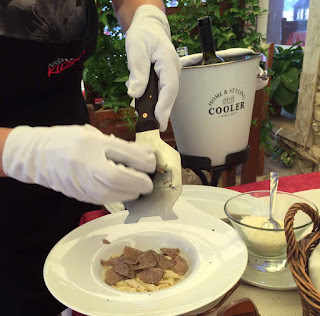 Our next stop was in Umag at Konoba Buscina for lunch. It was a picturesque setting and Marko, our guide, told us to expect a delicious lunch. We were not disappointed as we feasted on goat cheese, prosciutto, grilled meat, pasta with freshly grated truffles, and more olive oil and wine. Marko dropped us off at the hotel and we said our goodbyes to him. 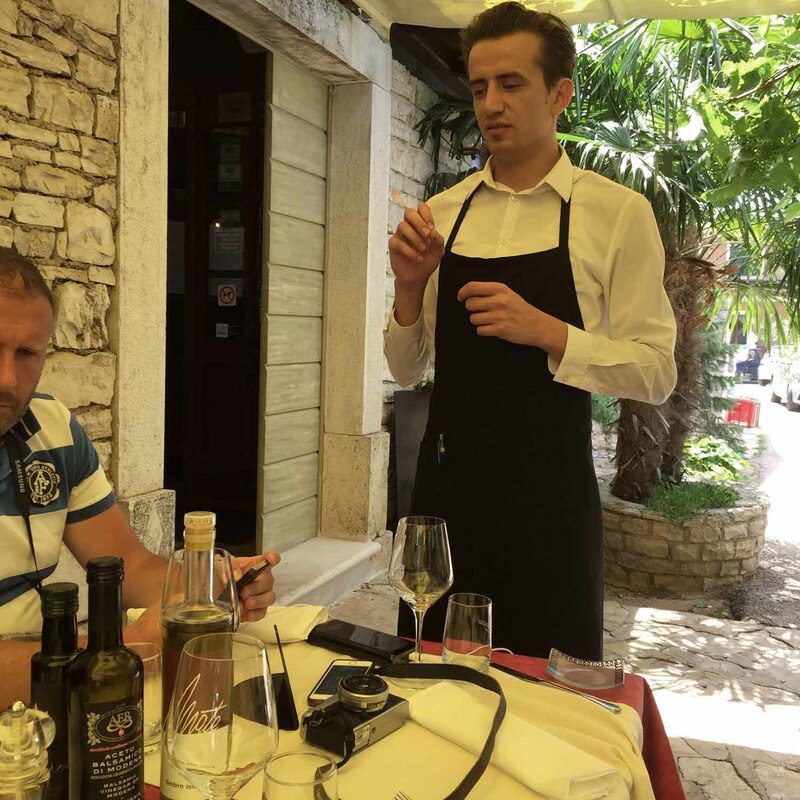 He and Goran had gone above and beyond in making us feel comfortable and welcomed in Istria. 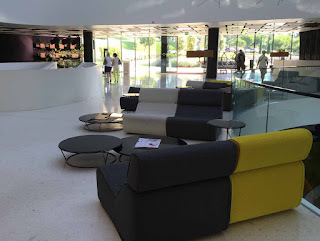 I was happy to have some free time to explore the grounds of Hotel Lone. 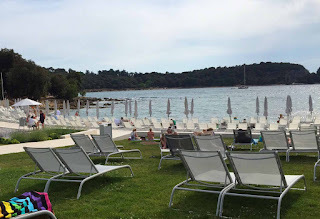 I even took a walk down to the beach area and did a few laps in the pool before returning to my room, where the infinity Jacuzzi on my balcony was warm and comforting. I decided to dress up a bit for the final night as long as we had time. 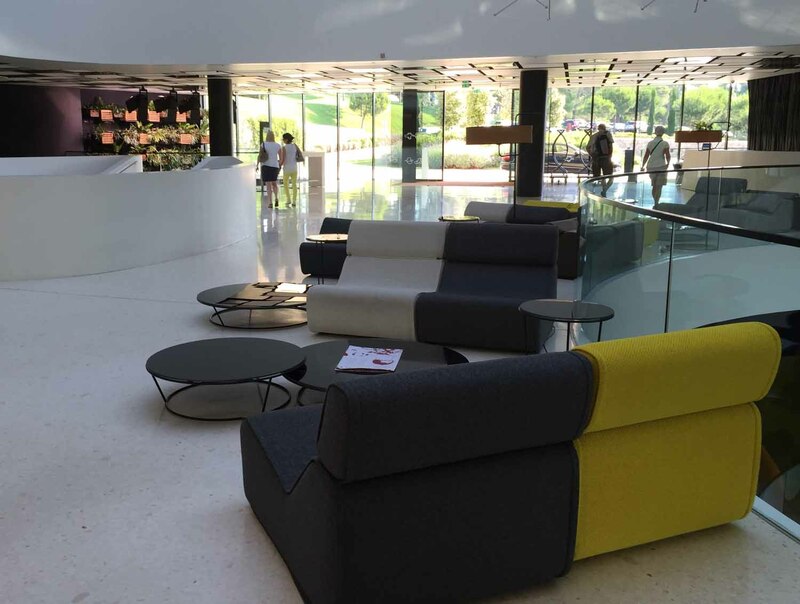 I was actually the first to arrive in the lobby, but Lynn, Rocky, Nicolas, Andras, and Georgy quickly followed. 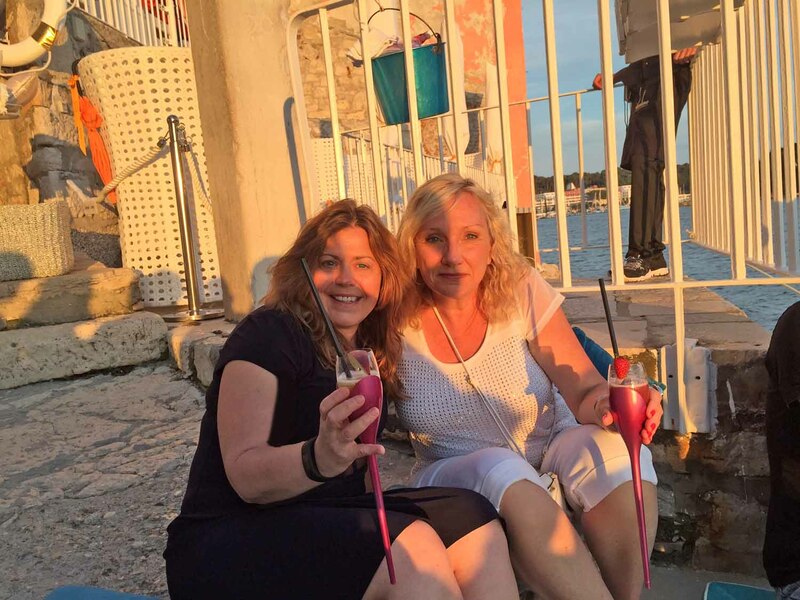 I wondered if the other Share Istria groups had gotten along as well as we had. On our first visit to Rovinj a few days previous, we had remarked that the Valentino Champagne Bar was an amazing place for cocktails and Goran had arranged for us to go there before dinner. Valentino was on a hill and they set it up so you could actually sit along the rocks that climbed down to the Adriatic Sea. 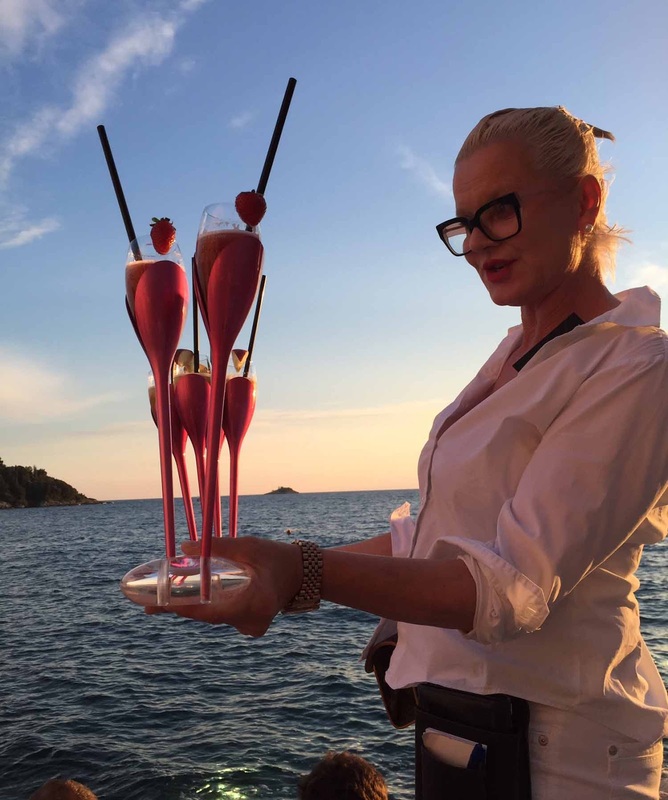 Two things made it even more breathtaking – a specialty Moet & Chandon Champagne drinks in specially designed glasses, and the opportunity to watch the sunset under these once in a lifetime circumstances. 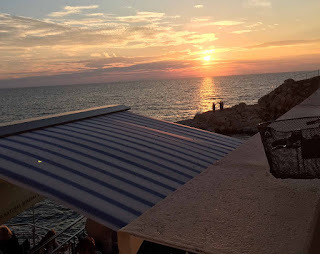 We continued to watch the sun fade away over the Adriatic Sea as we walked a few doors down to have dinner at Puntulina. 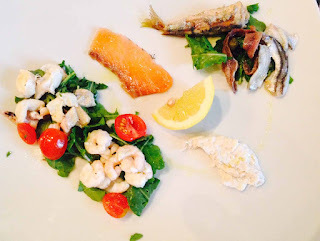 Our last meal was as memorable as our first, with the freshest Italian and Croatian food flowing, along with the Istrian wine I had come to love. Platters of prosciutto, cheese, meat, and pasta kept coming. Lynn and I, who are both allergic to seafood, were a bit jealous when we saw the plates for the men, but our food and rich desserts were also pretty amazing. 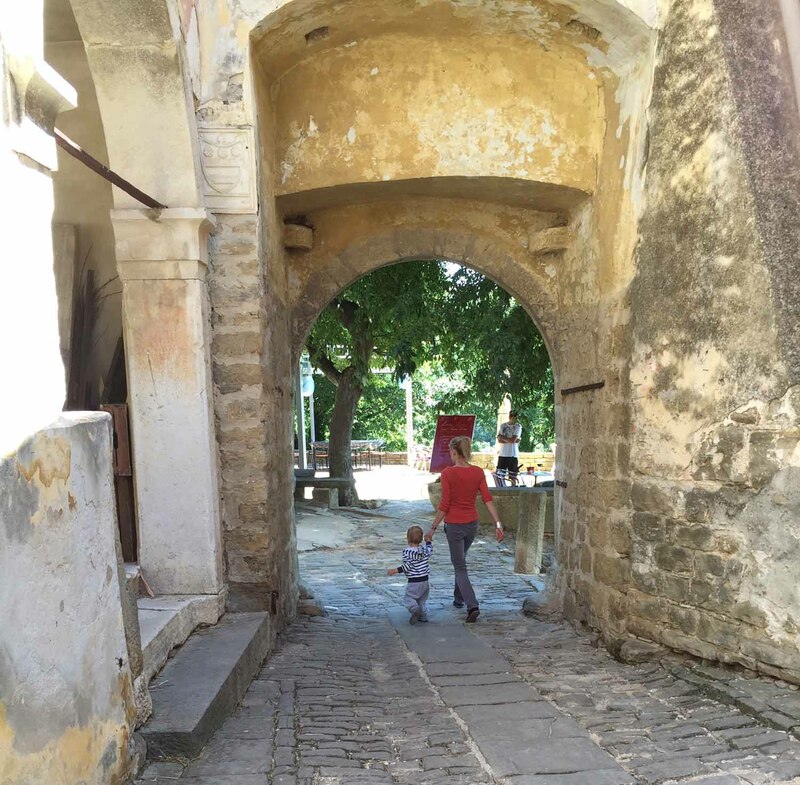 We walked back through the Rovinj Piazza. The weekend was nearing and more people were coming down. There were even musicians playing in the background. It was definitely a bittersweet night as we all said goodbye in the Hotel Lone lobby. Although we had talked about going to a club our last night, we were too tired, saying “Zbogom” to our Istrian adventure. 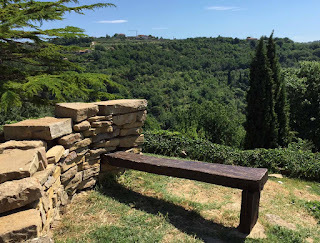 While this marks the end of the Share Istria adventure, look for more stories on that week in my other outlets (search #ShareIstriaUSA1, the designation given to Lynn and I). The rest of the Croatian trip through Rijeka and Split will be coming soon.